After all the worries, the concerns, all that, the trip was flawless. He went through our checkpoints and gates like we were timetabled. Mike (my brother) and I had agreed on a meet point in Gatwick and both parties showed up on time at the spot. Shared a seat on the train with Brittany (my niece) on the ride into town and watched the realization sink into her that this was London. I’d felt the same way when I’d come here in the 80’s. After getting settled in the hotel (off Gloucester Tube stop), went for a tube ride/familiarization run with the team – everyone got the system pretty quick, so everyone could make it home fine). Having said that, I got us off at the wrong stop (was aiming for Speakers’ Corner off Marble Arch but hit Hyde Park Corner instead. Woops – what do I know?. Anyway, we crossed through the park where a “Christmas village” was going on – rides and food and such. 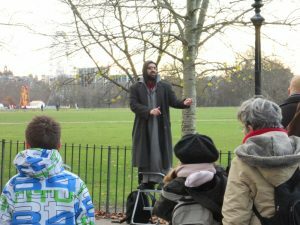 Speakers’ Corner was a bust. I’d been hoping to show them the excitement of debate (and heckling) in action but it was just one tired Arab guy trying to rouse a crowd amongst the cold and curious tourists. I love Hyde Park but in the dead of winter, it hardly shows its beauty. Talked everyone into a short run to the British Museum (I think the promise of warm bathrooms sold it). We all split up and looked around but after about 30 minutes, there was some joint cell-calls back and forth as everyone’s collective batteries were running down. Headed home for our after-flight naps. 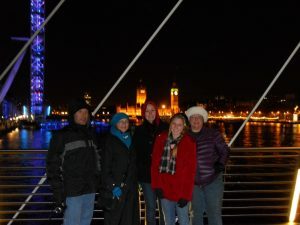 That evening, all of us (save Mike’s wife Kris, who was still pretty beat) went out for a walk along the embankment. It was cold and crisp and glorious, and everyone had a good time. From Hungerford Bridge, it’s a panoramic night view of the downtown area. Then a quick run to Trafalgar Square to watch the carolers. All in all, it was a pretty good day!